Have previously written a about my experiences in the Philippines. Wiill take it up again. All the times that I've been in the Philippines has always been warm swimming water but not this summer. This year it was slightly chilly. I was so surprised. Even in Bohol where I spent some days, it was not as hot. As you dive in the Philippines, there is no need for a warming wetsuit andif you dive lower than 10 m deep and comes up in the surface water, you feel the the very good "hot tub" water. I discussed what happened with my daughter yesterday and asked her if she remembered what happened. Of course you never forget such a thing. What will the explanation be that this beach water felt cold last summer. In the month of July is the rainy season and normally it rains bursty but in between, the sun shines so the sun can heat the water. Now it was compact cloudy both night and day. My daughter who is now older and of course has her own mobile with an installed app on the phone so we could measure the air temperature. We discovered that it was the same temperature both day and night. 26 or 27 degrees around the clock during the day when we measured the temperature. The clouds have an amazing ability to level out the temperature differences between night and day. Limits solar radiation during the day and retain heat during the night. I did not notice any difference on the UV rays. I was almost as red as usual. UV rays can penetrate clouds better than visible light. 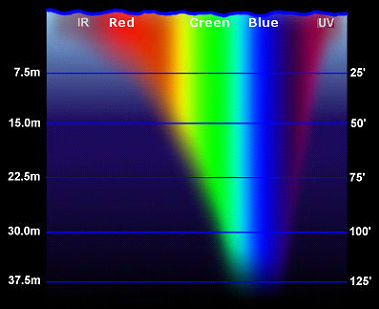 About half of the sun's radiation is radiant heat / infrared and the other half is visible half lljus plus some UV. Water vapor absorbs most of the heat radiation, and that is why infrared telescopes are built on high mountains like Mauna Kea in Hawaii. Visible light penetrates better. Clouds can reflect both types of radiation. 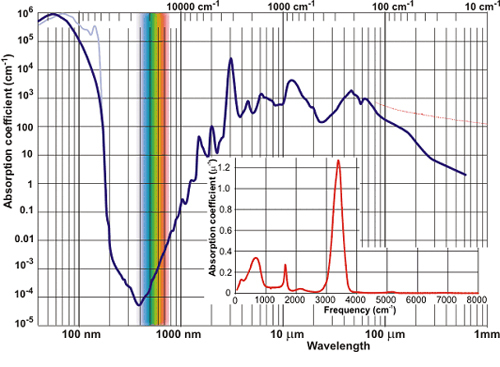 See the diagram of the solar radiation wavelengths of 100 nm (nanometers) to 1 mm. 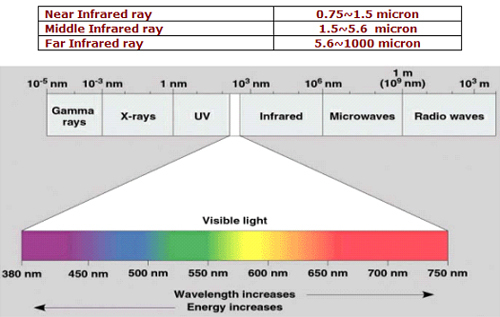 All radiation to the right of visible light up to one millimeter are heat radiation, IR radiation. Then we have light absorption in liquid water. A couple of other diagrams of how the light penetrates into the water. The first is of water in shallow seas. 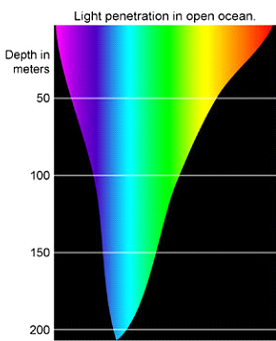 But the strange thing is that the light penetrates more in the deep sea see chart below. Notice how badly IR radiation penetrates. It is stopped at the surface. Ir-rays heats up only the top millimeter. When the sun don´t shine directly the water is not heated. There must be a cloudless sky that let enough sunlight through for the water to warm up a bit more. This was what I experienced in the Philippines. It is not only water that is heated by visible light. How much light is transmitted through the clouds is important for the climate. Less clouds and more light rays reach the earth's surface and it becomes more heated during the day on land and more heat is absorbed by the oceans. Have there been any changes in cloud cover over recent decades? 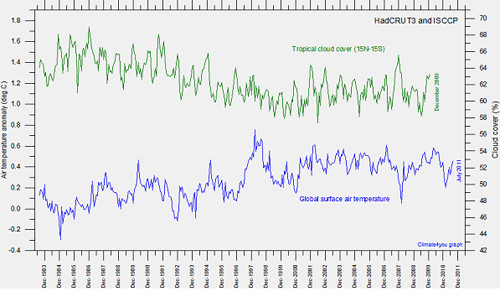 Check the following chart of the cloud cover in the tropics and the simultaneous warming. it is interesting to examine the graphs from 2000. Both graphs are essentially horizontal. Some researchers say that with this small difference in the clouds we can explain the warming of recent decades. To explain this increase is said that " This SW brightening is attributed to a decrease in cloud coverage ". Cloud mass has decreased slightly and this means more than the increase of CO2 in the atmosphere write the authers. Even the IPCC climate report writes about the clouds importance.